As the energy sector begins to pick up, investors may look to sector-specific ETF strategies that cover energy infrastructure or master limited partnerships to better target areas of opportunities and better enhance market exposures going forward. “MLPs have gone through a transition of rectifying their balance sheets, changing your corporate structures. The energy space are on firmer footing as well as we go forward. 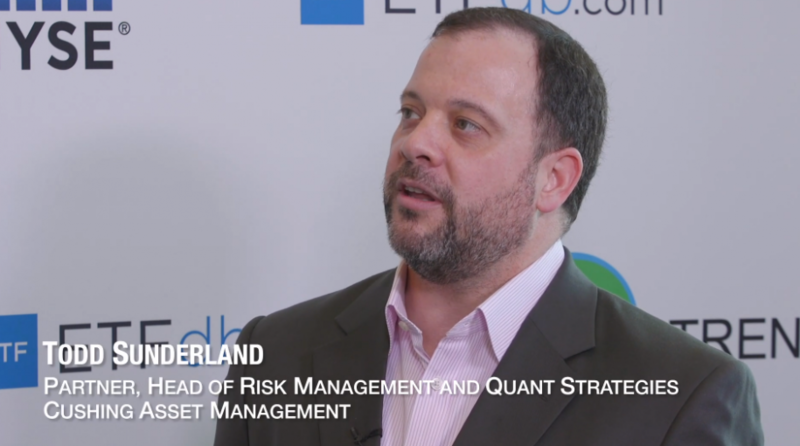 So, we do think there’s an opportunity going forward as the energy markets continue to work through their recent problems,” Todd Sunderland, Partner and Head of Risk Management and Quant Strategies at Cushing Asset Management, said at Inside ETFs. For example, Cushing has recently come out with a handful of its own master limited partnership-related ETFs, including the Cushing Utility & MLP ETF (XLUY), Cushing Energy & MLP ETF (XLEY), Cushing Energy Supply Chain & MLP ETF (XLSY) and Cushing Transportation & MLP ETF (XLTY). To improve tax efficiency, these MLP-related ETFs limit exposure to MLPs to 24% at each quarterly rebalance. Traditional MLP funds that hold more than 25% of their portfolios in MLPs are structured as C-Corporations and must pay corporate income tax on distributions before passing them on to investors, which incurs additional tax headaches come tax season that translates to lower overall returns. On the other hand, the Cushing MLP ETFs include exposure to other mid-stream companies on top of traditional MLP exposures. Specifically, XLEY includes energy sector names taken from the S&P 500 Energy Index. XLSY includes components from the S&P 500 Energy and S&P 500 Materials Indices. XLTY incorporates holdings from the Dow Jones Transportation Average. Lastly, XLUY includes S&P 500 Utility Index components. The ETFs also have a focus on income generation with components reweighted by their yield. For more ETF-related commentary from Tom Lydon and other industry experts, visit our video category.